The first Hainan International Film Festival held in Hainan in December, 2018, was a great success, which provides a new opportunity for the development of Hainan’s film industry. Liu Wenjun, the member of the Hainan Provincial Committee of the CPPCC, suggested that Hainan should seize this chance to create “Hainan Film Island”. From his point of view, the establishment of Hainan Film Island can promote the development of tourism, exhibition, entertainment, fashion and other relevant industries in Hainan. 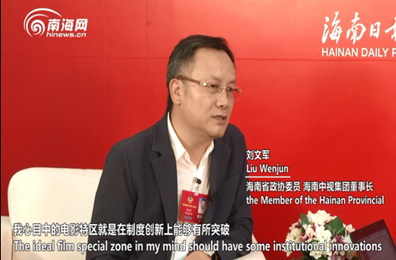 “The ideal film special zone in my mind should have some institutional innovations, let all the movies, including those are not published to the market and some controversial ones, could be watched in Hainan,” Liu Wenjun said in an interview with hinews.cn. According to Liu Wenjun, the cinema line has developed quite well in recent years in Hainan, but they are all centralized in big cities like Haikou, Sanya, Danzhou and Qionghai, other cities and counties are relatively lagging behind, some cities and counties do not even have modern digital cinemas. During the interview, he raised three visions for Hainan Film Island. Firstly, with the development of Hainan Pilot Free Trade Zone, Hainan can introduce six major production companies of Hollywood to establish joint venture film production companies, to make Hainan a tourism destination for all the fans from all over the world. Secondly, Hainan can develop advanced business environment and film production mechanism of the nation, to establish a film production base with complete industrial chain, supporting facilities and preferential policies to attract worldwide filmmakers. Thirdly, making digital cinema more popular than that in other cities and provinces of the nation. New film formats, new technologies, new equipment, and new concepts should be firstly tried and promoted in Hainan.